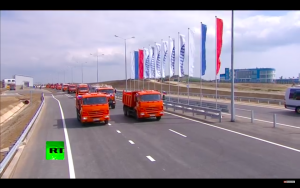 Russian President Vladimir Putin triumphantly drove a truck across the newly-constructed bridge from mainland Russia to the annexed Crimean peninsula. “The 19-kilometer (11.8-mile) bridge, which took two years to build and cost $3.6 billion is Putin’s project to show that Crimea has joined Russia for good. Transportation links to Crimea deteriorated after both the Ukrainian and Russian militaries set up checkpoints into the peninsula and trains crossing the Ukrainian mainland were canceled,” wrote The Times Of India. “Let’s hit the road!” the president exclaimed before jumping into the cab of the truck. Ukraine expressed anger at Putin attempting to ‘legitimize the occupation’ of the Crimean peninsula. Russia took the infamous piece of land without firing a shot after the Maidan Revolution in Kyiv which saw the overthrow of pro-Russian ruler Yanukovych.